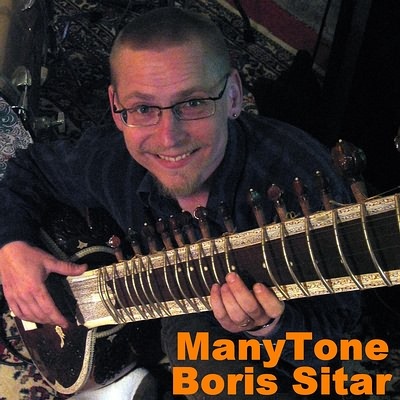 Manytone Boris Sitar is available for free in ManyStation/WusikStation format through the Manytone FreeZone to all Manytone customers who purchase a VST from us. It is also available for sale if you have not purchased one of our VST products. Click here to listen to a demo of Boris Sitar. Price: $9.95 for a single format or $12.95 for multiple formats. Handmade Sitar owned and played by our friend "Boris" (pictured here with the Sitar). Individual drones and long full decay samples. Sampled in 24 bit. Includes some professionally crafted presets for ManyStation and WusikStation version 2 and up. These presets blend and layer the samples into a very playable instrument. With some of these presets you can pitchbend just the notes and leave the Drones unaffected. Also some of the presets make use of the modulation wheel to add various pitch and other modulations that help make for a responsive, playable sampled Sitar. The Soundsets (but not the presets) will also load in ManyGuitar, ManyOne, EVE, and other sample players that load the WusikSND format. Includes an SF2 with the Drones on the left octave and the notes on the right octaves. Also includes a drones only SF2. This is so you can load the drones into one SF2 player and the notes into another player. This way you will be able to pitch bend only the notes if you wish and play the drones separately as we described above in the WusikSnd Version. No presets are included with the SF2 version as different SF2 players all use different formats, but the Sitar soundset is ready to load into any Soundfont player and is natural and ready to use as is or you can easily create a few of your own presets. This version is the 24 bit stereo sample set embedded in a VSampler Instrument file. Also includes the separate drone set.